Lake George — The high price of curbside parking in Lake George has a payoff for local taxpayers. Parking fees and other revenues collected by the village government, now paying a substantial portion of the municipality’s operating costs, has enabled the village to avoid a tax increase, Mayor Robert Blais said this week. Monday March 26, Lake George Village Board approved a 2012-13 budget that reduces spending and holds the tax rate flat while paying higher costs for health care and retirement. The budget calls for expenditures of $4.07 million, offset by $2.52 million in revenues and an unexpended balance of $240,000 —leaving $1.3 million to be raised by taxes. The estimated 2012-13 tax rate, $8,48 per thousand of assessed valuation, remains the same as the 2011-12 fiscal year. Estimated 2012-13 village parking meter receipts of $545,000 — plus an expected $525,000 local share of sales tax revenues — provide a lion’s share of the expenses of providing services in the village, Blais said. “This is a tremendous budget,” Blais said, noting that virtually every village department spent less than budgeted in 2011-12. Blais gave special credit to village Clerk-Treasurer Darlene Gunther and Public Works Superintendent Dave Harrington for cutting governmental costs, allowing savings to pay for expenses in the upcoming year. “It’s another good year for Lake George Village taxpayers,” he said, noting the municipality has averaged a mere 1.5 percent increase in taxes annually over the past five years. The budgeted flat tax rate was achieved despite a $22,000 increase in employee retirement costs and an additional $33,000 or so in health care premiums for 2012-13, he said. Despite a 50-cent pay raise allocated for village employees — which Blais said was needed to keep their pay competitive — the Village was still able to set aside money in a capital reserve fund. Water district appropriations were set at $866,300 — calling for no increase in water rates. The village revenues, Mayor Blais noted, included $2,292 in pennies, nickels and dimes thrown by tourists into the village’s Centennial Fountain in Shepard Park. The budgetary news prompted village Trustee John Root to do something uncharacteristic for his long tenure — he voted to approve the budget. Root has annually cast a No vote to the budget, objecting to what he says is an inequitable village sewer rate. For years, Root has called for a rate based on water usage. In this vein, he noted Monday that the mayor pays more in sewer fees for his apartment than the local laundromat does, prompting a chuckle from Blais. 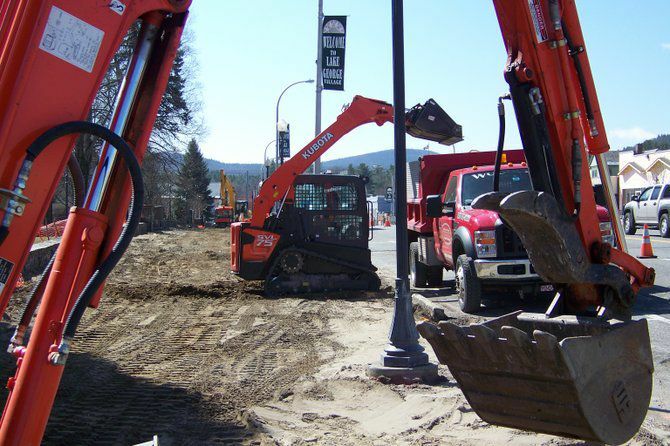 Approved borrowing $563,000 for one year from the First National Bank of Scotia — at an interest rate of 0.95 percent — to pay immediate costs of the Canada St. streetscape reconstruction now being undertaken. Heard village Trustee Joe Mastrodomenico’s proposal of converting the village rest rooms to operate on recycled wastewater. He showed the board details of how a $6.3 million rest area near Sharon Vt. uses orchids, plants and organisms to purify wastewater that is then reused for flushing toilets. Were informed that the contract between the Big Apple Circus, Warren County and the village was likely to be signed this week. The famed circus is going to be offering shows during a two-week run in late July.